In recent weeks the focus of work on the new Heritage & Arts Centre has been at ground level and below. The ongoing survey work has been mapping the services along Ashworth Street and Southgate Street as well as getting a better idea of the composition of the soil itself. 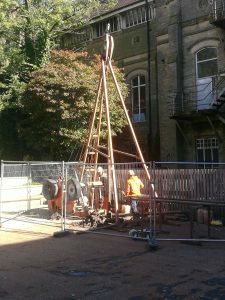 In September a large boring rig was setup in the Gallery gardens. This machine drilled down several metres underground and the results gave us lots of information about the soil type and composition. This work also provided reassurance that there are no large voids or bodies of water underneath us. These results have helped to confirm what the underlying soil conditions can handle in terms of the completed building’s weight. These gardens will see more work in the coming months and they will be reformed and landscaped as part of the project. We have been working with Oldham’s Parks Department to discuss the future planting of this space. Whilst the works take place they will also work to salvage and relocate as many plants as possible. Alongside our own project, the plans for the new Oldham Coliseum Theatre are also moving forward. This will be built on Southgate Street carpark and we can’t wait to welcome our new neighbour to Union Street. If you haven’t seen the details of the Coliseum’s plans then check them out here. 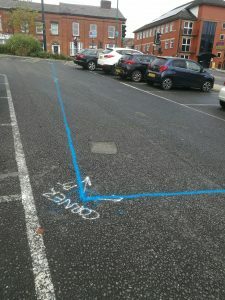 For now if you look carefully on Southgate Street carpark you will see that the footprint of the new Coliseum building has been mapped out in blue paint. It is fascinating to stand in the space and imagine a new building rising from the carpark floor over the next couple of years. The Heritage & Arts Centre project is funded by the Heritage Lottery Fund and the Stoller Charitable Trust. Full details of the plans and our original announcement are here.